Are wine prices becoming the arena of choice in the battle for top end diners? Hot on the heels of the news that Bob Bob Ricard W1 is offering â€˜bargainâ€™ prices on its most expensive wines, we hear that Tom Aikens SW3 is letting lunchtime customers BYO, without corkage, until the end of October. Aikens told Cateresearch.com that â€˜people have stopped drinking at lunchtime to a certain degreeâ€™, which of course limits the â€˜hitâ€™ involved in letting them bring their own. Is this use of wine as a high-profile promotional device perhaps the beginning of a trend? It does seem that the recession ainâ€™t quite over yet. To post a comment you must be registered and signed in. Ristorante Frescobaldi opens on the site of a Strada â€“ now there's a move upmarket! If no map appears click here to use our alternative map. Want to be a restaurant critic? 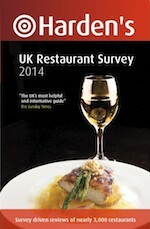 Complete our latest restaurant survey now, and you can earn a free copy of our 2015 UK Restaurant guide (worth over £15). Just tell us about your best... and worst dining experiences of the last twelve months. Last year we sent out over 6,000 free guides. Make a start now, and you can return at any time to finish it off.